WASHINGTON -- The number of Americans filing new claims for unemployment benefits rose a bit more than expected last week, but remained at levels consistent with tightening labor market conditions. Initial claims for state unemployment benefits increased 4,000 to a seasonally adjusted 302,000 for the week ended Aug. 30, the Labor Department said Thursday. Claims for the prior week were unrevised.Economists polled by Reuters had forecast claims climbing to 300,000 last week. A Labor Department analyst said there were no special factors influencing the state level data. The four-week average of claims, considered a better measure of labor market trends as it irons out week-to-week volatility, climbed 3,000 to 302,750. Still, both claims and the four-week moving average continued to point to a strengthening jobs market. The claims report has no bearing on August's employment report as it falls outside the survey period. The government is expected to report Friday that nonfarm payrolls increased by 225,000 last month after rising by 209,000 in July, according to a Reuters survey. That would be the seventh straight month that job gains have exceeded 200,000, a stretch last seen in 1997. 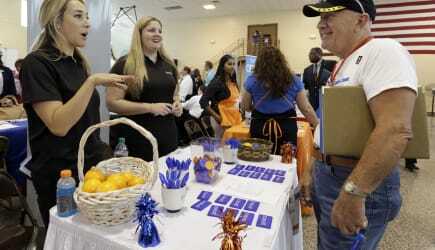 The unemployment rate is expected to have declined one-tenth of a percentage point to 6.1 percent. The jobless claims report showed the number of people still receiving benefits after an initial week of aid fell 64,0000 to 2.46 million in the week ended Aug. 23. That was the lowest level since June 2007.